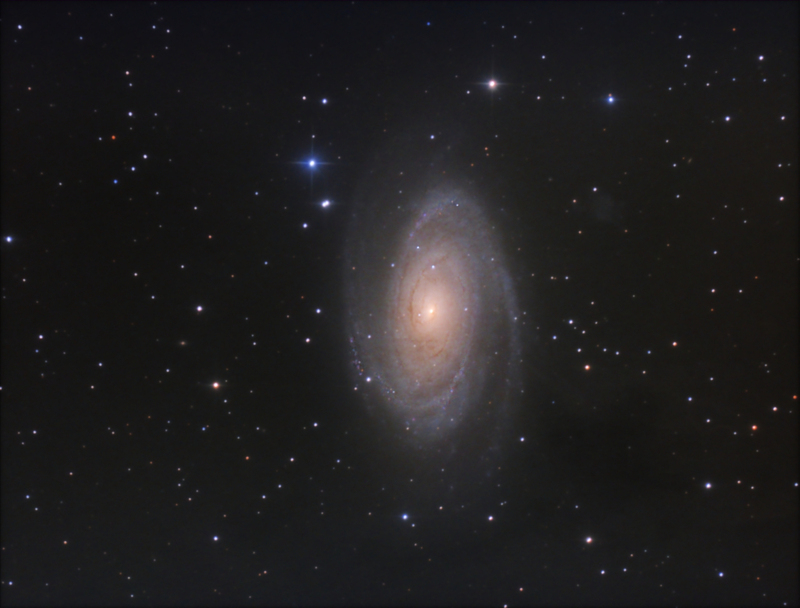 Here is an image of M81 taken from suburban skies. At the time the SQM reading was 19.1 mag / arc-second squared. While testing some new stretches in a beta release of Images Plus I noticed that there was some faint nebulosity around the galaxy. It turns out that this is the Integrated Flux Nebula a very faint cloud of dust filling the region. Arp's Loop is just visible to the lower right of the galaxy. The background of the image has received an extreme stretch that is only possible from the light polluted location due to the extended 144 minute exposure. This image was processed entirely in a beta release Images Plus 5. Calibration, stacking, initial ArcSin stretch was followed by several iterations of SMI processing. Masked noise reduction, was used to control the noise between applications of the SMI process. Contrast layers were used to increase the contrast of the IFN and a mask was used to limit the effect on the galaxy. Star reduction was applied with a mask to limit the effect to just the stars in the image. One last contrast tweak using curves with a soft light combine was used before the image was binned and cropped.